This is obviously a riddle even if the answer is not immediately clear. Where this differs from your average ARG out in the wild is in the familiar “riddle” phrasing; it immediately lets the students know there is something to solve here and some piece of hidden information they need to discover. “Wild” ARGs usually plant the mystery among a variety of other seemingly innocuous information, and the players work together to first filter the signal from the noise and then begin cracking the puzzle once they figure out what it is. This riddle uses the most elementary of ciphers: the Caesar cipher. It is as simple as encoding gets: all the letters in the encoded phrase are substituted or “shifted” for another letter; if it was a “shift” of “3” then A would be encoded as D, since it is 3 spots down the alphabet. Therefore, you need only two things to crack a Caesar cipher: the knowledge that it is, indeed, a Caesar cipher, and how many times it’s been shifted. If you know that number, then you have the key. The first sentence nudges the students toward this knowledge. Aeneas founded Rome, which leads to Julius Caesar, and the word “to” has been swapped with a big, bold red “2” to draw their attention that it is a shift of two. At this point, the student is well on their way to solving the riddle since it will be trivial to decipher the scrambled second line once they connect those dots. So, let’s skip down to the third line, since that actually lets them know what they need since, as you’ll see, the unscrambled second line isn’t the answer itself. “STANDARD” is in all caps – obviously important – and Dolus has let them know he is looking for a “number”, but which one? It apparently has to do with “books” and every book has “2” of these numbers (emphasized again as another clue for the Caesar cipher’s key). A little sleuthing around and students eventually stumble across the International Standard Book Number. Each book has a 13 digit one and a 10 digit one, and clearly Dolus wants the “smaller” of the two, so 10 digits it is. But which book? Back to the scrambled second line. Running the phrase through any Caesar cipher decryption tool (with a shift of “2”) gives the students: “Edith Hamilton Mythology Hardcover 1976”. A quick search to Amazon or elsewhere will give you the number Dolus is looking for: 0848810376. In the past iterations, students would email that answer to Dolus, using the email address they discovered, and he would answer with the next puzzle in the game. One of my projects this year is to modify the game to make more use of password protected files and videos. In this case, Dolus will send them a password locked folder along with the introductory video, and the password to the folder will be the ISBN number. Once they find the ISBN they can continue the game without my direct involvement. Managing the responses and guesses of students becomes very taxing when you are relying on email. It also can cause students to lose momentum as they have to wait to see if they’re right. The foundation of many ARG puzzles are codes and ciphers. These not only offer intriguing and challenging critical thinking exercises (and often a lot of math, to boot) but they help avoid a critical design flaw: false negatives. A false negative – getting or making progress towards the right answer but not realizing it – is perhaps the worst case scenario for an ARG puzzle. If a student began to correctly solve a puzzle but did not receive clear or immediate feedback that they did so, the game’s puzzles could feel arbitrary, or even impossible. In my experience, students do not mind spending hours failing, but progressing, to crack a puzzle (in fact, they often love it!). However, if they were to invest significant time into a puzzle only to later realize they had abandoned the right solution hours ago, it could be a fatal blow to their motivation and engagement. Codes and ciphers, however, instantly and accurately indicate success. Once you solve a code based puzzle, the answer wholly, or in part, reveals itself. Even if they haven’t solved the entire puzzle, a crucial sense of progression is achieved. As a result, they are the bread and butter of many ARG puzzles. One of the best resources on designing puzzles for ARGs – especially those using codes and ciphers – is this fantastic article by Adam Foster. Adam was the brain behind a very successful ARG to help promote the launch of Valve’s Portal 2 video game. He does an amazing job breaking down the logic and DNA of a good ARG puzzle and I highly recommend you read it before you start designing your own puzzles. Let’s look at another puzzle I created for later on in the game that makes use of some more tried and true ARG mechanics. In this particular puzzle I chose to use a book cipher because it would potentially involve the physical medium of an actual book (more mediums means more immersion), and I found an easily accessible example of the cipher’s use in the Sherlock Holmes novel: The Valley of Fear. In fact, I decided to weave the novel directly into the clue. I used the free text to video site, xtranormal, to create another video clue (it looks like xtranormal is back from its long absence, now rebranded as nawmal.com, but isn’t available for education/free users yet). It uses a combination of preset animations and a voice synthesizer for text to speech. I used xtranormal to save time compared to doing another custom video in iMovie, but as I said before, it helped augment the pervasiveness of the game: the more mediums and formats the games incorporates, the better. It also added to the narrative, which played into Dolus’ character as the mysterious thief that can be anywhere, at any time, in any form. 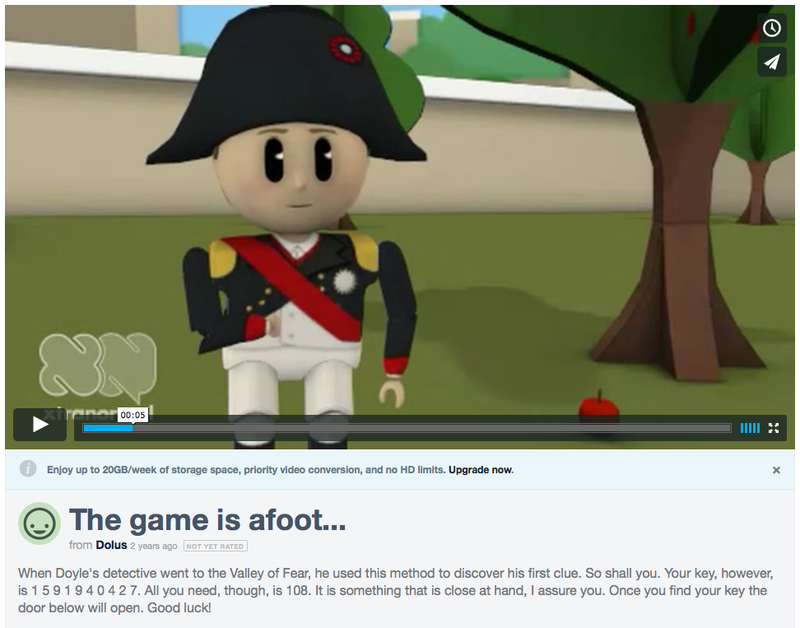 The clue itself was spoken in the video but the key text was also copied in the video description to make it easier for students to reference as they worked to solve it. 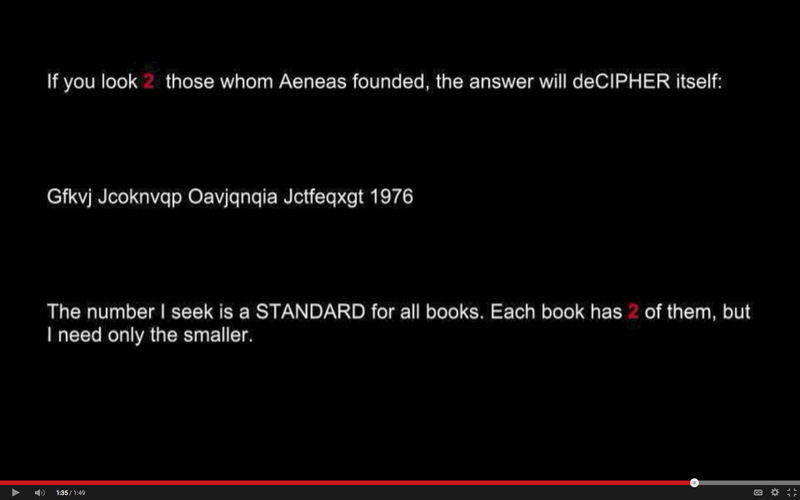 Like most ARG puzzles, and the previous one, it is multi-step and centers around the identification and decoding of a cipher, in this case a book cipher. In Dolus’ video clue he directly references The Valley of Fear which forces the student, at the very least, to find out what that is and likely end up at the Wikipedia entry. From there (or the novel itself) the students will realize that the “method” Sherlock Holmes used was a book cipher. Modeling their strategy after Sherlock’s (and likely with some help from the Wikipedia page), they will realize they need three things: a particular book, a specific page in that book, and specific words on that page. The book they need, the “key”, is their classroom copy of The Odyssey, identified by its ISBN 1591940427, hence it being “close at hand”, and the page in question is 108 (This is also a callback to the earlier puzzle involving ISBNs). But what of the seemingly random series of numbers? If they execute the cipher correctly, they discover that each number refers to a word on the page, e.g. 220 is the 220th word on page 108. Once compiled correctly (they will realize if they’re doing it right very quickly because a sentence will begin to form – no false negatives! ), they will see they are being asked to email Dolus the name of Odysseus’ father, something that memory or a quick search will remind them is “Laertes”. Once that name is emailed to Dolus, the next puzzle begins. Again, a planned reform for this iteration is to have a locked file or website that will be unlocked once “Laertes” is punched in. As you can see in the wording of this puzzle, the hints have been mostly stripped out: no bold letters, no capitalized words. This puzzle appears later in the game, and the “difficulty level” has been increased accordingly. They know by now they need to parse every word and examine every meaning of each word. Every piece of the clue must be interpreted and cannot be ignored. A synthesis of multiple elements must be achieved to complete the puzzle. This type of synthetic puzzle solving is a crucial form of 21st century critical thinking. The internet puts a deluge of data at our fingertips; the hard part is figuring out what you need, when you need it, and why. This type of critical thinking challenge is exactly why I love using this type of game based learning in my classroom and it is exactly the type of challenge they love to bang their head against. It is also the type of creative problem solving that our students will need in the decades ahead. Even more, it is exactly the type of cleverness that saw Odysseus out of the Cyclops’ cave and helped him persevere on his journey home to Ithaca. Thanks for the heads up! Once I have a chance try it out, I will be sure to update my post accordingly with my thoughts.